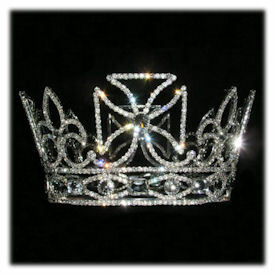 One of the most stunning crowns we have ever offered! This royal, full circlet diadem features alternating fleur-de-lys and Maltese crosses, just as in the official crowns of England. Completely studded with faceted rhinestones and with a silver-plated frame, this crown glistens and sparkles like no other! The crown measures 4.25" high and 7" in diameter.